It is said that Karni Mata(Deshnoke, Bikaner) is an actual person who lived during Mogul rule of India. Karni Mata is also known as Nehadi Jee. Karani mata is born in Charan community who used to write the records of Rajputs in Dingal dialect. The puja of Karini Mata is performed by Charans. It is said that Karini Mata used to worship seven sister deities of whom the eldest is Awadi [also pronounced as Aawdee Mata] Mata. These seven sisters had a brother named Mehar Kha Jee. The names of the seven sisters are  Awadi  Ashee  Seshi  Gehal  Huli  Rupali or Rupli and  Langde. They are the children of Mamdia [father] and Mohvritti. Mamdia used to live in Sindh region. Mamdia and Mohvritti visited Hinglaz Mata Temple [now in Pakistan] for seven years praying for children. Hinglaz Mata pleased by the devotion of Mamdia and Mohvritti told the couple that She will take birth as their seven daughters and a son... Later the couple migrated to Marwad region. 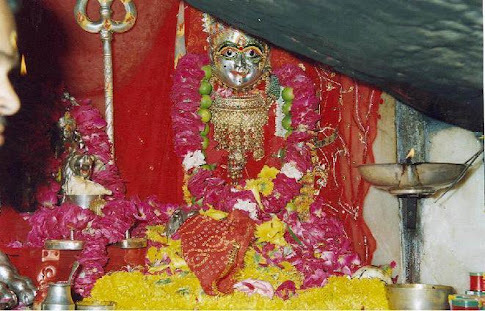 There is a famous Awadi mata temple in Udaipur [Mewad region.] also. It is said that these sisters were born during Vikram Samvat 806 and lived for 191 years. These sisters are said to have the capability of taking the forms of Tigress or Snakes. These sisters have 52 temples and are known with different names at different places. Mostly the deities get the name of the village at which the temple is located. Thannod Mata is one among them. Thannod Mata became very famous after Indo Pak war. The story says that few Indian soldiers took shelter in the Thannod Mata temple during the war and Pak soldiers in large numbers surrounded the temple. It was night and the firing started. Surprisingly all the Indian soldiers survived and many Pak soldiers died because of cross firing. The remaining Pak soldiers withdrew thinking that there may be large numbers of Indian soldiers. Nagnechi, Nagaure [may be Naga + vooru, Vooru in Telugu language is a village or a small town, meaning that Nagaur town in Rajasthan may be the place of Naga people]. Osia Mata appears oldest deity as seen from the picture of the deity along with Hinglaz. Incidentally Nagnechi Mata is the Kuldevi of Rajputs. [A3] An inscription in Karini Temple in Dingal dialect that tells that Awadi Mata is non other than Hinglaz Mata.